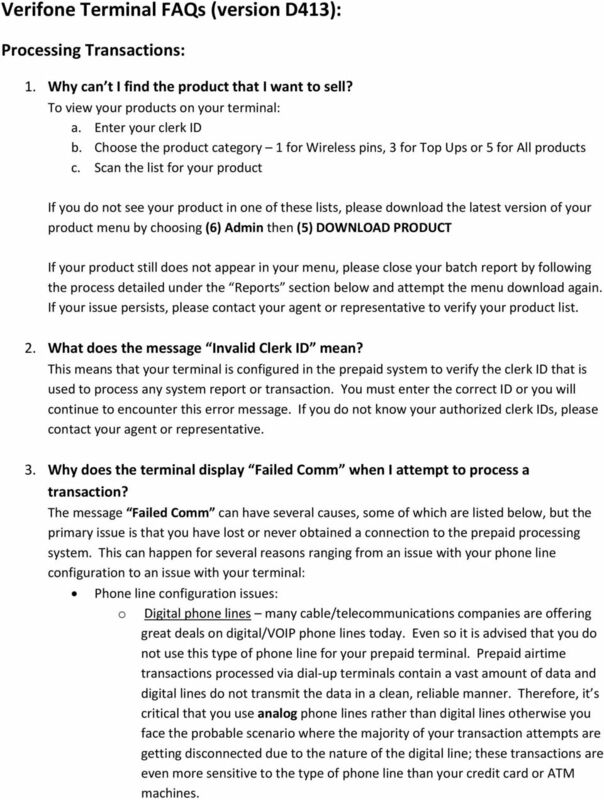 Download "Verifone Terminal FAQs (version D413):"
1 Verifone Terminal FAQs (version D413): Processing Transactions: 1. Why can t I find the product that I want to sell? To view your products on your terminal: a. Enter your clerk ID b. Choose the product category 1 for Wireless pins, 3 for Top Ups or 5 for All products c. Scan the list for your product If you do not see your product in one of these lists, please download the latest version of your product menu by choosing (6) Admin then (5) DOWNLOAD PRODUCT If your product still does not appear in your menu, please close your batch report by following the process detailed under the Reports section below and attempt the menu download again. If your issue persists, please contact your agent or representative to verify your product list. 2. What does the message Invalid Clerk ID mean? This means that your terminal is configured in the prepaid system to verify the clerk ID that is used to process any system report or transaction. You must enter the correct ID or you will continue to encounter this error message. If you do not know your authorized clerk IDs, please contact your agent or representative. 3. Why does the terminal display Failed Comm when I attempt to process a transaction? The message Failed Comm can have several causes, some of which are listed below, but the primary issue is that you have lost or never obtained a connection to the prepaid processing system. This can happen for several reasons ranging from an issue with your phone line configuration to an issue with your terminal: Phone line configuration issues: o Digital phone lines many cable/telecommunications companies are offering great deals on digital/voip phone lines today. 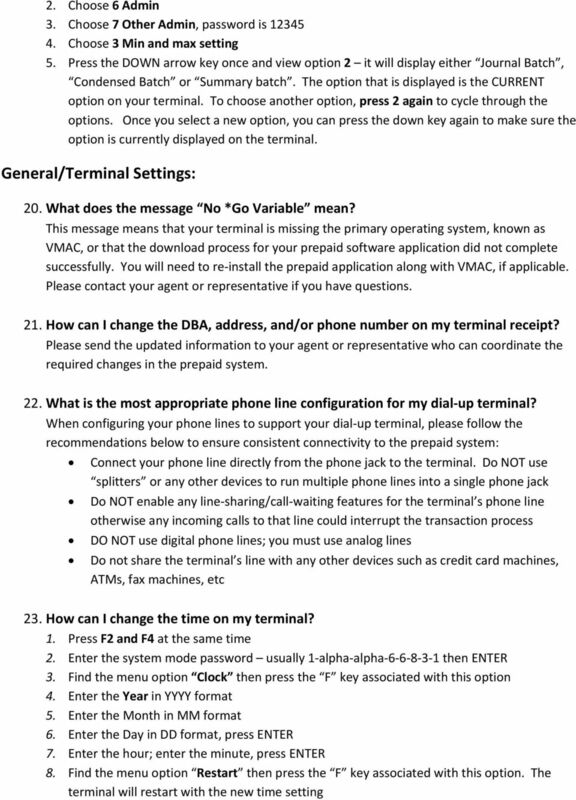 Even so it is advised that you do not use this type of phone line for your prepaid terminal. Prepaid airtime transactions processed via dial up terminals contain a vast amount of data and digital lines do not transmit the data in a clean, reliable manner. Therefore, it s critical that you use analog phone lines rather than digital lines otherwise you face the probable scenario where the majority of your transaction attempts are getting disconnected due to the nature of the digital line; these transactions are even more sensitive to the type of phone line than your credit card or ATM machines. 4 5. Enter the Account # & Confirm (*account number = the mobile number which was topped up in the original transaction) 6. Enter the transaction Amount (*this will also appear on your receipt) 7. You will receive a receipt confirming whether the void was successful or not. If the void failed for any reason, you can contact your agent or representative for more information. 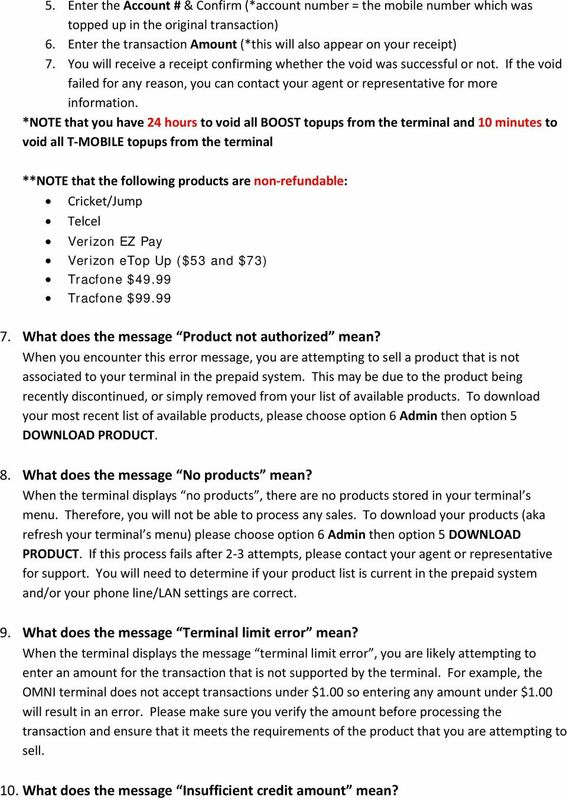 *NOTE that you have 24 hours to void all BOOST topups from the terminal and 10 minutes to void all T MOBILE topups from the terminal **NOTE that the following products are non refundable: Cricket/Jump Telcel Verizon EZ Pay Verizon etop Up ($53 and $73) Tracfone $49.99 Tracfone $ What does the message Product not authorized mean? When you encounter this error message, you are attempting to sell a product that is not associated to your terminal in the prepaid system. This may be due to the product being recently discontinued, or simply removed from your list of available products. To download your most recent list of available products, please choose option 6 Admin then option 5 DOWNLOAD PRODUCT. 8. What does the message No products mean? When the terminal displays no products, there are no products stored in your terminal s menu. Therefore, you will not be able to process any sales. 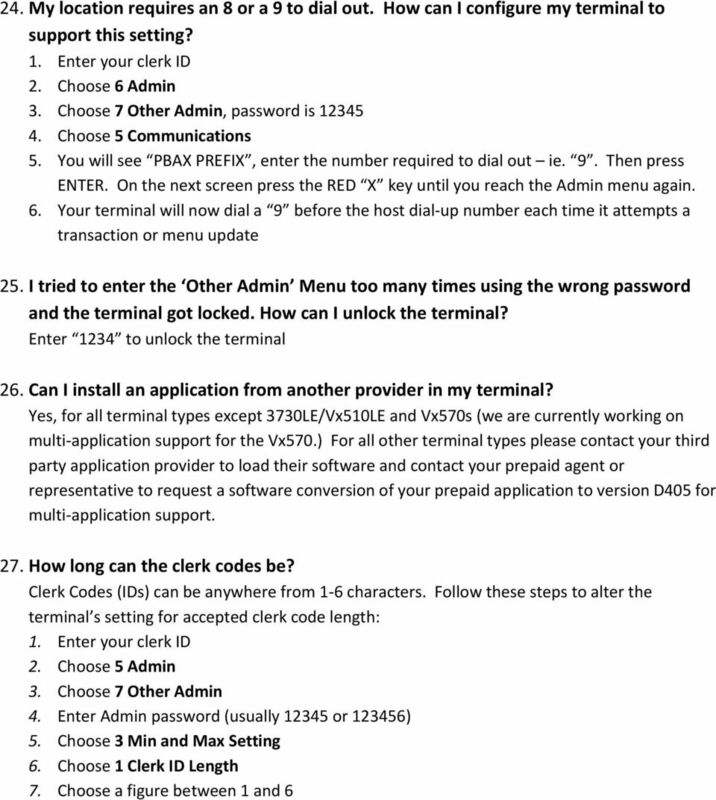 To download your products (aka refresh your terminal s menu) please choose option 6 Admin then option 5 DOWNLOAD PRODUCT. If this process fails after 2 3 attempts, please contact your agent or representative for support. You will need to determine if your product list is current in the prepaid system and/or your phone line/lan settings are correct. 9. What does the message Terminal limit error mean? When the terminal displays the message terminal limit error, you are likely attempting to enter an amount for the transaction that is not supported by the terminal. For example, the OMNI terminal does not accept transactions under $1.00 so entering any amount under $1.00 will result in an error. Please make sure you verify the amount before processing the transaction and ensure that it meets the requirements of the product that you are attempting to sell. 10. What does the message Insufficient credit amount mean? 5 This message indicates that you have reached your credit limit for prepaid sales. Contact your agent or representative to continue processing transactions. 11. What does the message Use Unlimited by Boost mean? This error message indicates that you are attempting to process a topup transaction for a customer with an Unlimited by Boost account, but you are using the wrong product. Please attempt the topup transaction again using the Unlimited by Boost product. If you have questions, please contact your agent or representative to confirm the product. Reports: 12. How do I view all of my sales for the day? Week? 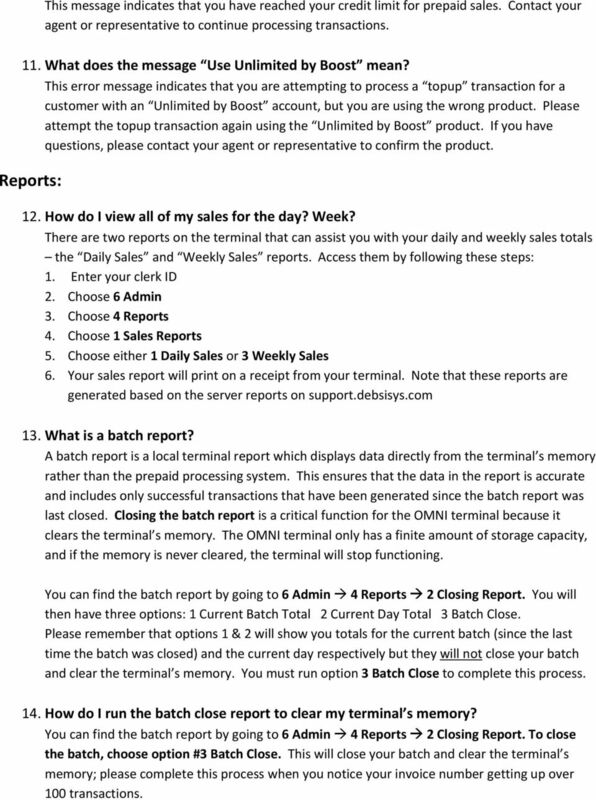 There are two reports on the terminal that can assist you with your daily and weekly sales totals the Daily Sales and Weekly Sales reports. Access them by following these steps: 3. Choose 4 Reports 4. Choose 1 Sales Reports 5. Choose either 1 Daily Sales or 3 Weekly Sales 6. Your sales report will print on a receipt from your terminal. Note that these reports are generated based on the server reports on support.debsisys.com 13. 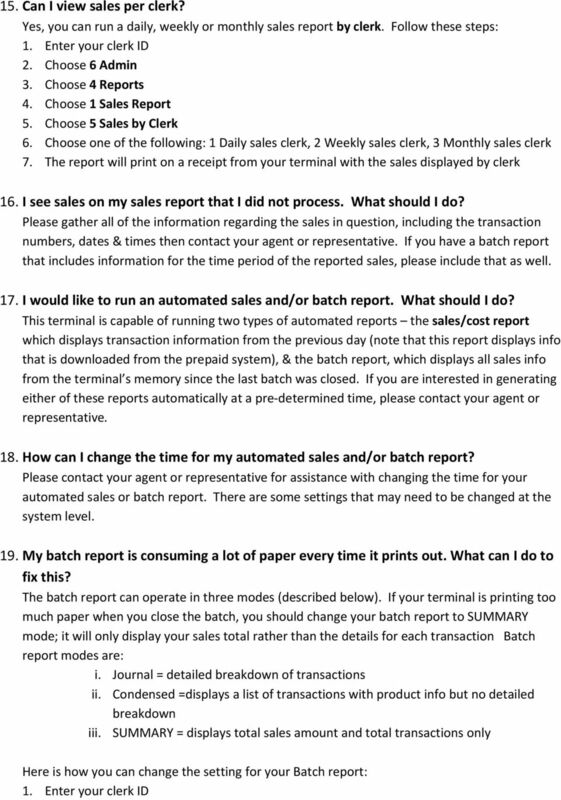 What is a batch report? A batch report is a local terminal report which displays data directly from the terminal s memory rather than the prepaid processing system. This ensures that the data in the report is accurate and includes only successful transactions that have been generated since the batch report was last closed. 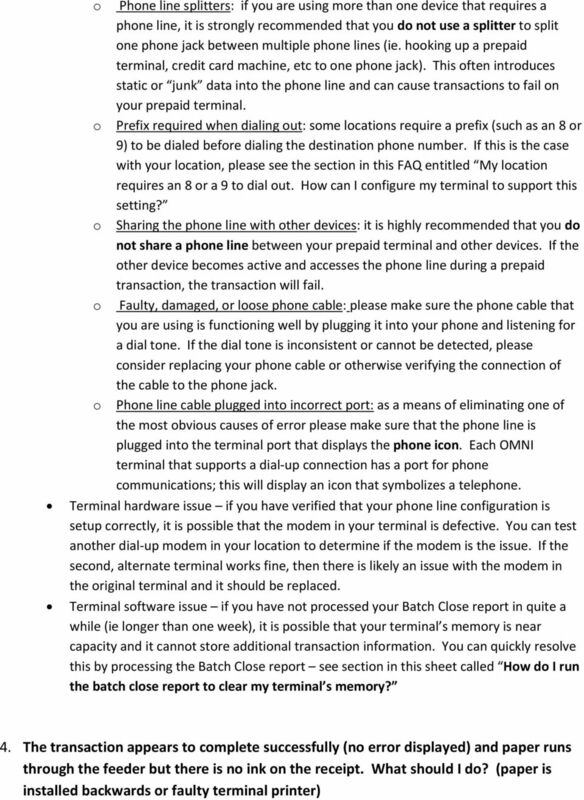 Closing the batch report is a critical function for the OMNI terminal because it clears the terminal s memory. The OMNI terminal only has a finite amount of storage capacity, and if the memory is never cleared, the terminal will stop functioning. You can find the batch report by going to 6 Admin 4 Reports 2 Closing Report. You will then have three options: 1 Current Batch Total 2 Current Day Total 3 Batch Close. Please remember that options 1 & 2 will show you totals for the current batch (since the last time the batch was closed) and the current day respectively but they will not close your batch and clear the terminal s memory. You must run option 3 Batch Close to complete this process. 14. How do I run the batch close report to clear my terminal s memory? You can find the batch report by going to 6 Admin 4 Reports 2 Closing Report. To close the batch, choose option #3 Batch Close. This will close your batch and clear the terminal s memory; please complete this process when you notice your invoice number getting up over 100 transactions. Dear Provider: June 10, 2011 The latest version of New York State Medicaid software for your Omni3750 will be required as of July 21, 2011. The new software is needed to comply with the HIPAA 5010 requirements. 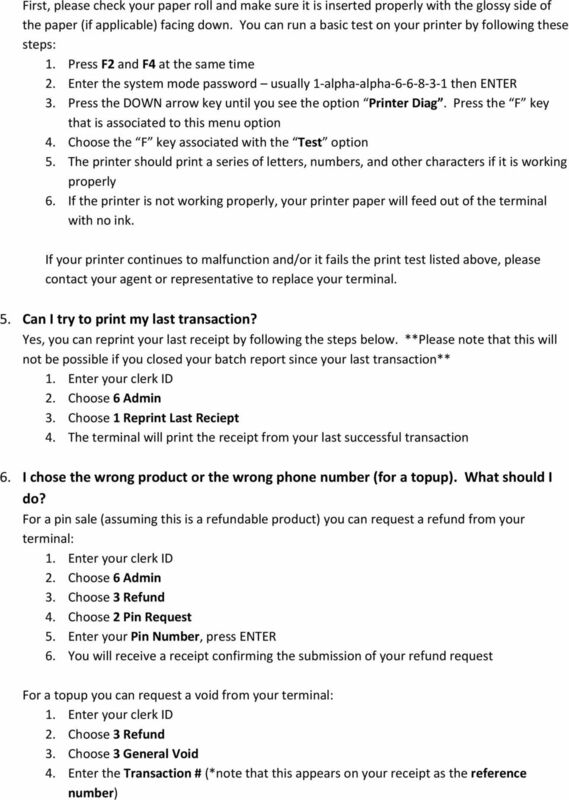 Printer - Replacement The following is a guide on how to swap out a WIC printer with another. A scenario where this might happen is when getting a service replacement for faulty hardware from Source Technologies. XD1000 Terminal User s Guide Printer compartment Holds the printer head mechanism and large capacity paper roll. Printer cover release Press button to release the printer cover and refill the paper roll. Guide for Updating Firmware and Troubleshooting Connection Issues This document provides detailed instructions for updating firmware and for troubleshooting for connection issues with Raspberry Pi board. Welcome to our self-diagnosis guide. Your offline interactive assistant for Telkom s fixed voice and Broadband services. TelNet Digital Fax. Reference Guide..
SBI Freedom. for each service provider. Price: see your VeriFone sales representative. Per student, Excluding VAT. WELCOME TO VERIZON HIGH SPEED INTERNET. For a better online experience, start here today.